Create dynamic role-playing adventures without preparation. For use as a supplement with other systems. NOTE: This product provides the Game Master Emulation rules found in Mythic Role Playing, a product that contains emulation rules and a full, universal role playing game (also available at paizo.com). Mythic Game Master Emulator is for those who do not want the universal role-playing rules, but just the game master emulator at a reduced price. 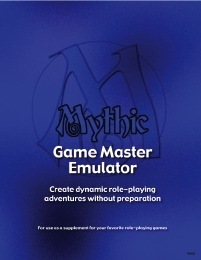 Mythic Game Master Emulator is a supplement meant to be played with your favorite role-playing games. Most Role-Playing Games operate under the principle that there are players and there is a Game Master. The GM prepares all the details of an adventure, and then "runs" the players through that adventure. This usually requires a great deal of preparation on the part of the GM. Mythic is different in that it requires no preparation from the GM. Mythic adventures are meant to be played off-the-cuff, with perhaps a few minutes of brainstorming to come up with the initial setup. Mythic can also be played entirely without a GM. The same mechanics in Mythic that allow a GM to run an adventure without preparation also allows a group of players to do without the GM. In a Mythic adventure, the GM (or players without a GM) can start an evening's entertainment with about five minutes of preparation. As the adventure unfolds, the GM is just as surprised by the twists and turns as the players are. No GM, multiple players: Players decide on an opening scenario, and perhaps a few details or two, and Mythic takes it from there. All action is decided through the asking of yes/no questions and the application of logical principles. By answering questions, the adventure moves along, with the occasional random event throwing players a curve ball. The action is broken into scenes, just like in a movie, to keep everything straight. No GM, one player: Mythic can be used to go solo. Solo play in Mythic works the same as group play. You're just alone. One GM, any number of players: For those who like to be a GM, we have something for you, too. The same tools that allow Mythic to automatically generate adventures on the fly without a GM also work with a GM. This means very little to zero preparation, if you don't want to prepare. Simply create an opening scenario (hey, you can come up with that on the drive over!) and follow Mythic as it guides you along. Mythic will throw in its own twists and turns, so the GM will be just as shocked as the players. 54 pages, with full-color cover and black-and-white and color interior. I've recently got a hold of this, and it's well worth the money. It draws from the logic of the players, percentile dice, and a chart to create improvisational events. It's amazing for giving you ideas when you draw blanks and has a system for tossing in surprises. It makes it possible to play without an overhead mastermind, but it really shines in alleviating the GM from a lot of the stress of random events. Much of the book is dedicated to explaining how to best utilize the tools that it gives you. The key is that it's all about interpretation. If you don't like interpreting the charts to the context and drawing connection between events, than this might not be to your taste. Overall I feel that it does all that it sets out to do splendidly. Found a detailed review on RPGnet.